Whether your bathroom is small or simply cluttered, these bathroom storage hacks will save the day! Here’s a bathroom hack for a small bathroom shelf. Build or buy a deep picture frame and hang it around your toilet paper holder. It will give you two convenient shelves for small items in your bathroom where every inch of storage counts. You should also check out this toilet paper roll hair band organizer. The back of your cabinet doors are a highly overlooked surface to utilize. Install this metal mesh bin on the inside of the cabinet and use it for cleaning supplies trash bags and more. Install one on the inside of the vanity cabinet under the sink in your bathroom to store your hair dryer, extra shampoo, conditioner and soaps. Here are more DIY cabinet door storage ideas you’re going to love. Buy this piece on Amazon. Hate the messy look of curling irons lying on the vanity or the toilet tank? Here’s a tip for you. Use hook-and-loop tape to attach 5-in. lengths of 2-in.- diameter PVC pipe to the vanity door to hold the curling irons. Do the same thing with 3-in. pieces of 1-1/2-in.-diameter pipe to hold the cords. Just measure your curling irons to see how long your “holsters” need to be. Let your curling irons cool before you stow them away. Here’s another PVC hack you should check out. For some reason, once the towel bar goes up, we don’t consider the wall usable for anything else. Why not hang a shelf for toiletries and decorative items? Just make sure to mount the shelf high enough so it allows easy access to your towels. Here’s how to replace a towel bar. Here’s a space-saving solution to the bathroom waste-basket problem. Screw wire shelf anchor clips to the inside of the door and hook the lip of a small wastebasket right on the hooks. It’s easy to use, it hides unattractive trash, and it frees up precious bathroom floor space. If you want to disguise other trash cans in or around your house, check out these 9 options. Cabinets and drawers in the bathroom can become cluttered and disorganized very quickly because of all of the small items that need to be stored there. To keep bathroom drawers neat and organized, look no further than the kitchen! You can use a silverware drawer insert to organize a bathroom drawer, too. The long compartments in a silverware organizer are the perfect size for storing toothbrushes and tubes of toothpaste. Medium-size compartments are great for disposable razors or clippers, and the small compartments work well for corralling lip balm, floss containers, etc. Check out these 10 kitchen cabinet and drawer organizers you can build yourself. Baskets do vital storage work around the house and make a wonderful addition to a bathroom. The perfect vessel into which to heap towels, a basket will also bring a softly rustic note, warming up marble or a pale palette. You can also use baskets as a hack for kitchen storage. A wire shelf unit makes a great addition to a bathroom. It adds both storage and display space, brightens up a dull wall and is lightweight and easy to hang for bathroom hanging storage. You can try it as over the door bathroom storage too. Prefer wood over wire? Here’s how to make an easy wooden crate shelf. Buy this unit on Amazon. Pullout towel racks are typically meant for kitchens, but they’re also perfect for cramped bathrooms. They keep damp hand towels and washcloths off the counter so they can dry out of the way. You can find pullout towel racks at discount stores and online retailers. Here’s how to install towel bars and hooks on a fiberglass tub and shower. Make bath time cleanup a breeze by putting toy bins right on the side of the tub. With the added benefit of eliminating the very adult pain of stepping on a dropped toy during a shower, this simple hack is a time saver and an attractive solution to the clutter of bath toys. All it takes is a tension rod, shower curtain rings and open-mesh bins. Once you get bath toys tamed, you may be in a mood to tackle the rest of the bathroom. Speaking of toys, check out these pool noodle hacks. If you need more than shampoo and a bar of soap in the shower, here’s how to provide space for all your vital beauty potions: Get a couple of those shelves that are designed to hang from a shower arm and hang them on cabinet knobs. Use No. 8-32 hanger screws ($1) to screw the knobs into studs or drywall anchors. These 10 showerheads will up your shower game even more. Tired of the clutter of shampoo and conditioner bottles along the rim of your tub? This tempered safety glass shelf on a cable shelf bracket is an easy solution. The cable shelf bracket requires only two screws for support. If studs aren’t located in the right positions, use toggle bolts to anchor the shelf brackets. The glass hangs on the cables. The cable shelf brackets (No. CSB5B) are available online from expodesigninc.com. Order a tempered glass shelf from a local glass company. We installed a 3/8-in.-thick, 12-in.-deep shelf. Want to add some more flair to your bathroom? Learn how to frame your mirror with glass tile. Many bathrooms have wall space, usually next to the door, that’s perfect for an extra medicine cabinet—or even two. With “recessed” cabinets that fit between studs, you don’t lose an inch of bathroom space. Medicine cabinets are available at home centers or make one yourself. Here’s how! Also, check out these bathroom vanity storage upgrades. Most toothbrush holders aren’t big enough for electric toothbrushes. They end up falling out of the holder or taking up too much room on the vanity. Here’s a clever storage idea: Make a holder for them using large grip-type clips. Mount the clips on your medicine cabinet or on a piece of wood that you can hang on the wall. The clips work great to keep your toothbrushes secure! If you recently upgraded to an electric toothbrush, check out these brilliant ways to repurpose your old standard version. 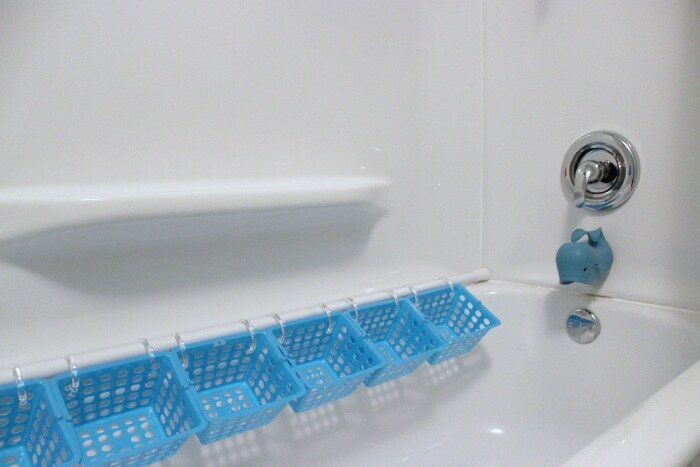 This handy hint doesn’t require much explanation: Make a simple magazine rack for the bathroom using a hanger. Just drape a few of your favorite magazines across the horizontal bar of the hanger; then hook it onto a drawer pull or cabinet knob for some light reading at the ready. You could also use this idea in the bedroom to hang magazines or a book on your nightstand. For a bunch of magazines, learn how to make these magazine storage containers. Find some rustic crates, bins, buckets or baskets of different sizes and rope them together with the smallest on top. For this one, the crates are roped together by their handles, with the whole tier hung up from two simple hooks on the wall or for some over the door bathroom storage. For more storage ideas, check out these 11 easy garage space-saving solutions. If you have a pedestal sink, there’s a lot of room around the bottom to store things, but that will likely look unsightly and cluttered. Grab some baskets and store bathroom supplies underneath the sink, then invest in a skirt to hide the baskets. Here’s how to plumb a pedestal sink. Plant holders meant for the wall can be incredibly intricate in design, making them wonderful for decor. Add a gallery wall of them in your bathroom, using plants in some and putting your hair care supplies in the others. If you don’t have a major green thumb, ditch the plants and add in more products! Here’s how it will look. As for all those hair ties? Try this hack that uses a carabiner. You know those magnetic strips that hold your kitchen knives or garden tools? They can also be used to hold the metal accessories in your bathroom, like bobby pins, tweezers and nail clippers. Here are more hacks that prove magnetic strips can be extremely useful for organization and storage. With the back swung up, this step stool is the perfect chair for little kids to plunk down on. With the back swung down, it’s the perfect step stool for reaching slightly-out-of-reach faucets, shelves and cabinets. Here’s how you can build one yourself. Want a little workshop stool you can store tools in? Here’s a simple one that you can make yourself.